*Terms and Conditions: Supply is limited; offer good on December 10th, 2012, only while supplies last. Bonus eGift Card will be sent separately to qualifying purchaser’s email address within 3-5 days. Limit one bonus eGift Card per customer. Bonus eGift Card offer applies to this item only. Card amount of $100 or more must be loaded to single eGift Card to receive $10 bonus eGift Card. eGift Cards are sent via email, usually within minutes. The eGift Cards are valid online at Walmart.com or SamsClub.com, or in-stores at Walmart or Sams Club. Good list of restaurant offers at EatDrinkDeals.com! Read the fine print on bonuses, because many have terms and short expiration dates! If you enjoy catching films at the Goochland Drive-In Theater, take advantage of this gift card special for the 2013 season, available for purchase online beginning today! Gift cards can be used for general admission, snack bar, and merchandise. Limited time and quantities. If you have a flexible spending account with your health care, you’re probably familiar with the November/December guessing game known as “How Much Do I Expect It Will Cost To Keep Me Healthy Next Year?” Guess too much, and you lose whatever amount you don’t use by the end of the calendar year. Well, now is also the time to plan gift card spending for the upcoming year. 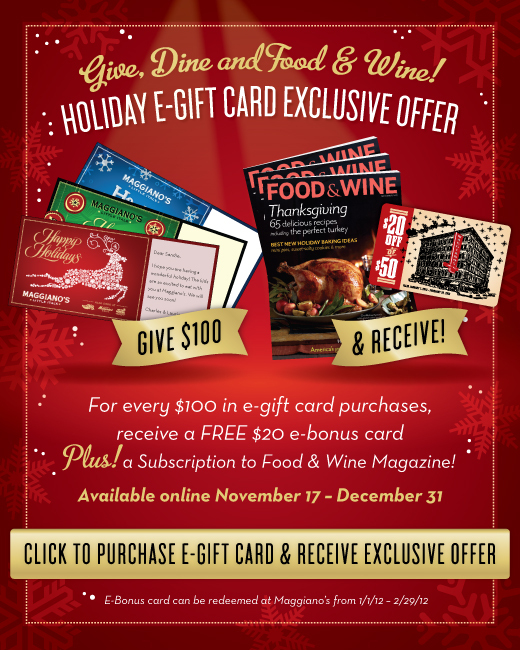 During December, many businesses, particularly restaurants, offer extra bonus incentives when you purchase gift cards. So you can stretch your money further by investing in gift cards to businesses where you will be shopping throughout the year (assuming you have wiggle room in your budget for the expenditure – putting them on credit cards and not paying them off will NOT save money). The nice thing about gift cards (versus flexible spending accounts) is that most gift cards give you longer than a year to use them! The challenge is that the accompanying bonuses often have short terms of redemption, like a month or two, so don’t get more than you can redeem in that time frame. Outback Steakhouse — Buy a $100 gift card, get a $20 bonus gift card. This doesn’t even come close to covering all the offers out there, so feel free to add your favorites! Famous Dave’s – Buy $25 gift card, get a $5 bonus card. IHOP – Buy $25 gift card, get a $5 off coupon. PF Chang’s – Buy $50 gift card, get a $10 bonus card. Subway – Buy $25 gift card, get a 6″ sub (excluding premium & double-meat) free. As you can see, the standard is a 20% bonus, ie: $5 additional value when you purchase $25 worth. If you dine somewhere frequently, consider buying whatever value you expect to use in the next 3-6 months. My favorite gift card deal last year was when Chick-fil-A offered a free cow calendar ($6 value) with $20 gift card purchase. The gift card lasted me through June or July, but I’ve been getting free items at Chick-fil-A every month this year with the calendar coupons. I haven’t seen that offer posted yet; hopefully will return after the new year.